A few weeks ago, during some caffeine-fueled fit of internet freebie hunting, I acquired a coupon for “One free multi-pack of Glucerna shakes (up to $11 off).” So I figured that, for free (or nearly), it was worth trying. 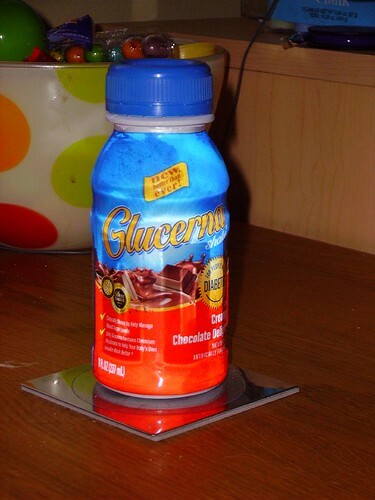 Glucerna shakes claim to be a dietary supplement or meal replacement of some sort, intended “for people with diabetes.” In addition to a bunch of nutrients, it’s got low sugar, high fiber, and some strange ingredients like chromium picolinate and “Enova” oil, which are supposed to help with blood sugar levels and whatnot. Healthy? Perhaps. 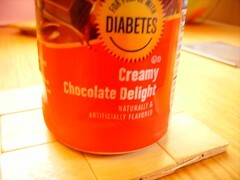 Useful for diabetics? Potentially. Regardless, there was only one question that I wanted to answer about Glucerna: Is it food? When I got around to buying the shakes, I was somewhat aghast to discover that a “multi-pack” of shakes consisted of six 8-oz bottles, for $11.29 at the local grocery store. This comes out to about $30 a gallon. At that price, these things had better be either damned healthy or damned good. Without a degree in food chemistry, I don’t feel comfortable commenting on the former (the shakes had no fewer than 45 ingredients). The latter would be proven shortly enough. First, a visual inspection. The flavor of shakes that I got was called “Creamy Chocolate Delight,” which I thought had less potential for terribleness (or at least, better potential for masking terribleness) than the vanilla-esque flavor. As with most health products, the ridiculous name was in all likelihood hyperbole–it seemed more than probable that the product was neither creamy, nor chocolatey, nor particularly delightful. The legend “New, better than ever!” that adorned the label gave me further cause for concern. Then there was the matter of the forty-five ingredients. If we’re generous and we assume that each of the 27 nutrients in the nutritional info had its own ingredient, this still leaves 18 ingredients that needed accounting for–not that I know which ingredients are meant to provide nutritional supplement. 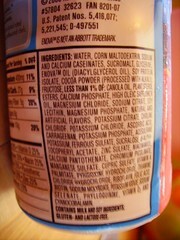 What the hell are “plant sterol esters“? “dl-alpha tocopheryl“? “Cyanocobalamin“? I’m not sure I want to know. Also, how the heck to they fit 200 calories into eight ounces of “beverage”? I figured there was probably something better to do with 1/10 of my recommended daily caloric intake. Other claims on the package included the fact that Glucerna won an award for taste–“…rated highest overall among leading brands by independent professional chefs.” This is quickly amended in a footnote to mean “best among diabetic nutritional shakes.” To me, this strikes me as similar to saying “most realistic plot among Steven Seagal films.” There’s not a lot of really exciting other stuff on the packaging, though I was interested to discover that “complete, balanced nutrition” seems to be a registered trademark. Wow. The visual inspection continued with a look at the color and texture of the drink. I poured the liquid into a glass and noticed that it had the same wet-but-thick flow characteristics that rice milk has. It also smelled like chocolate-flavored baby formula, with the metallic bite of a multivitamin. The Picky Epicurean’s comment was that it smelled like “chocolate chalk.” And the color was a pallid grayish-brown facsimile of chocolate. It looked a bit like something that accompanies the hairballs that one of the cats yorks up. Speaking of the cats, I thought it would be a good idea to use one of them as a guinea pig–after all, if it wasn’t good enough for the tabby, I’m not sure if it was really worth inflicting it on myself. 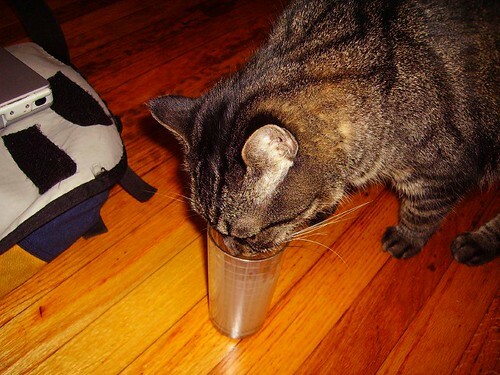 So we let one of the kitties sniff around the bottle, just to see whether he would recoil in horror. 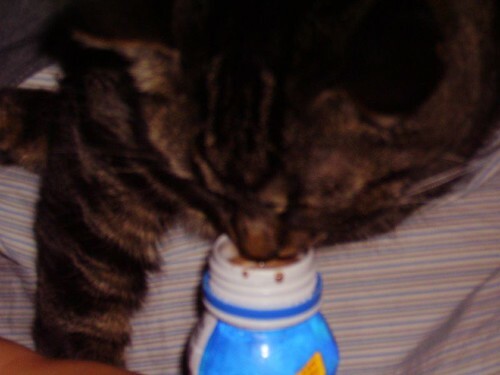 The cat seemed to like it, which was a good sign, but Zeke isn’t known for his discriminating tastes. The time had come, and there was really no avoiding it. I had to attempt to consume the product. The Epicurean threatened that she would not kiss me if I did, in fact, drink the Glucerna, but for the sake of science I had to put my love life on the line. So down the hatch it went. “Creamy Chocolate Delight” Glucerna opens with a vaguely “chocolate-esque” taste, and quickly follows with a decidedly medicinal flourish. If one closes one’s eyes real hard one might be able to pretend one were drinking Carnation Instant Breakfast mixed with powdered horse vitamins. Before long, the powdered pocket change taste breaks through, though, disabusing the drinker of his fantastic Carnation daydream. As the metallic nastiness clings to the back of the throat, one notices a distinct grittiness throughout the palate. Presumably whatever milk solids are actually in Glucerna (assuming there are any) are just too solid for their own good. Between the nasty texture and the vitamin aftertaste, if I were the Picky Epicurean, I wouldn’t kiss me. 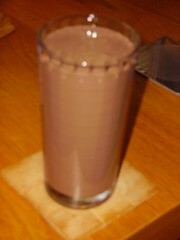 If there were such a thing as a chocolate flavored Flintstones Kids vitamin, it would probably taste something like this. Flinstones Kids are fundamentally a good idea because they make something unpalatable just bearable enough to swallow. But changing that into a powdery, tinny liquid and increase the volume from a bitty little pill to something the size of a “nutritional shake” just doesn’t work. So is it food? I’ll let you be the judge. But Zeke seems to think so. Posted in Do not like!, Is It Food? Oh, man. Just reading your description made me feel ill. Of course, me being drunk right now might have helped. What are you talking about, Steven Seagal’s films are entirely realistic! In fact, a lot of them mirror my own life. I think even “food-type” is a stretch. It’s not even kept in the same aisle as the normal food. It’s over by the shampoo and the toothpaste!